I have dabbled in audio recording for many years with varying degrees of success. While I once thought that only the direct feed from a guitar plugged in would get a good quality sound I am now convinced that microphones are best. I have been using a Zoom H1 for a number of years, it is a stereo condenser mic that records to a micro SD card, at the low price end of the stereo condenser mic range. Perhaps one day I will venture out into the more expensive land of mics, but for now, I get more than I can deal with already at this level. But I am a sucker for getting the graphic EQ "right". Where "right" means what my ear hears, through my fancy closed monitor headphones. Almost without fail I will boost the bottom end frequencies slightly, decrease the mid slightly, and boost the top end. I have many presets I have created but each recording I will listen with the EQ being applied realtime, drive up a frequency range to max to see what it sounds like, drive it down to min to see what it sounds like without it, and then pick an appropriate increase/decrease or leave it as it is. The mid range I have removed here is what I'd call the "AM radio" sound, whereas the low and high ranges give more of the "FM radio" sound. You can overdo it, and many times I have, so I have to remember to calm down and not "over produce" the audio. Levels are important, particularly at recording. You don't want to overdrive and clip, but you don't want to be so low that you aren't using up all the dynamic range you have. I've read many times about aiming for a peak recording level of -12db, but you know, I reckon go a bit higher. If the crescendos have a tiny bit of clipping I think that is okay, almost "nice". It's not "pure", but it kinda accentuates the power of the top end of the volume dynamic range. Even when I apply my EQ filters I don't stress too much if it maxes out with a tiny bit of clipping. That's because you want the end result to fill out the dynamic range of the signal, ie, be as loud as you can get. "Stuff sounds better when it is louder". If someone jumps on to your youtube video and has to turn it up, then you didn't get you final amplitudes right. But I stop short of compression. Sure, with compression you can max out the levels in frequencies without clipping, create this powerful "wall of sound", but you are heading into over produced land again, like adding reverb and other delay effects. That original signal - the pure sound of an instrument - you want to stay true to that. Get the original sound right to start with, don't dabble too much from there. I'm sure this can be said to distorted electric guitar, I don't do much with them anymore. And here's where I was when I was inspired to ramble on about this. Your time range dynamics, that is, over the course of a song where it goes soft, then goes loud, that's important. If when you are preparing to record setting up your mic, play as loud as what you intend on playing during the recording and set the level so that is close to the boundary of clipping, lock in that setting, perfect. But what if you can't do that? Or, things change during the recording session and you can't change the level setting? I have had this problem several times while recording my kids orchestra and band performances. I will set a level, record, and then later find it was way too low, or way too high, and that ruins the whole recording. The Zoom H1 has an auto level feature. Where it will ramp up the level if the signal is low, or bring it back if the signal is high. I once believed that this was awful, complete heresy, worse than compression. I don't think that now, because, after ruining a few recordings getting the levels wrong I reluctantly turned it on for the last performance. The problem being that I leave the mics on stage, and the little kids perform, the big kids perform, guest performers, then everyone combined - no chance of setting a fixed permanent level, even if I could access the mics in between performances. You know what? The auto level was not as awful as I was expecting. I had two mics set up for either side of the orchestra, a H1 and a H1n and both did a similar admirable job. Sure there was the expected occasional "inrush", where the mic had scaled itself up trying to hear something as the performers were waiting to start, and the first note smashed the level, the mic went "WHOA!" and scaled right back, and it is very apparent in the wavefile. You know what? 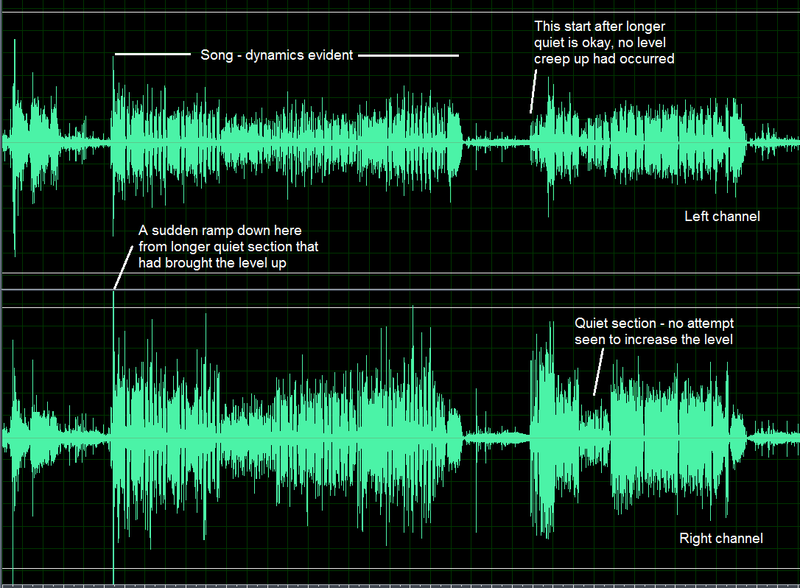 Perform an amplitude fade for those few events and you will barely notice. Looking at this sample stereo wavefile the first song is louder than the second, so it's not like the mic is constantly hunting to have every moment at a pre-designated amplitude. If I was to guess, and I'm allowed to because I write control algorithms for a living, I would say the Zoom will work in a range where it won't change the level until an extreme high event comes along where it very quickly scales down, and it's only if it's not hearing a minimum signal will it scale it up. So most of the time it is doing nothing, just leaving the level setting alone. Which is exactly what you want in the situation I just described! Yes; you will get a few glitches but fix/hide them in post production. That is nothing compared to ruining a recording by fixing a level that is not appropriate. Mind, changed. Key learing: do fix the audio level if you know what to expect; if the unexpected is expected and you can't change the level as it happens, then turn on auto level and deal with the very few issues you will get in post.